Elastomeric components are widely used in engineering. Increasing demands are placed on them to withstand hostile conditions such as high temperature and corrosive environments. These demands make it harder to predict likely service life or improve design to ensure their longer-term performance. This important book reviews the wealth of research on understanding fatigue and failure in elastomers, and how this understanding can be used to predict and extend their service life. The first part of the book reviews factors determining ageing behaviour such as heat, corrosive environments, wear and cracking. It also discusses the strengths and weaknesses of current service prediction models. The second part of the book focuses on analysing and improving the design and service life of particular applications such as O-rings, bearings, springs and valves. 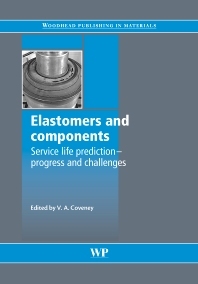 With its distinguished editor and team of contributors, Elastomers and components: service life prediction; progress and challenges is an invaluable reference for engineers involved in the design and use of elastomers. Part 1 Ageing behaviour and life prediction methods for elastomeric materials: The five year accelerated ageing project for thermoset and thermoplastic elastomeric materials: A service life prediction; Effect of heat ageing on crosslinking scission and mechanical properties; Resistance of bonds in rubber components to corrosive environments; Assessment of life prediction methods for elastomeric seals - A review; Parameter dependence of the fatigue life of elastomers; Strain energy release rates for some classical rubber test pieces by finite element analysis; Heuristic approach for approximating energy release rates of small cracks under finite strain multiaxial loading; Abrasive wear of elastomers. Part 2 Specific geometries and application issues: Life prediction of o-rings used to seal gases; Stress induced phenomena in elastomers and their influence on design and performance of o-rings; Magnetorheological devices; Selection of elastomers for a synthetic heart valve; Using FEA techniques to predict fatigue failures in elastomers; Fatigue life investigation in the design process of metacone rubber springs; Fracture of rubber-steel laminated bearings. Dr Vince Coveney is Director of the Engineering and Medicine Elastomers Research Centre at the University of the West of England. He is a member of the Rubber in Engineering Committee of the UK Institute of Materials, Minerals and Mining.